On our way home yesterday, Andy and I decided to finally pop into an antique store that we'd driven by a hundred times. Being a collector and a lifelong fan of antiques, I was (naturally) distracted by all of the amazing bits and bobs. Old keyhole covers, door knobs, cornices, and stained glass windows were everywhere - and up high on top of a display case was a super cool, giant, taxidermied hyena. "Andy look at that hyena!" I said and immediately focused in on something else, "Uh. Jamie did you see the spinning wheel?" Sure enough, right next to the hyena was a beautiful old spinning wheel. Geez, Jamie, how could you miss that!! From our vantage point on the ground everything seemed to be intact, and the price seemed fair. We found a kind member of the staff to bring him (the wheel) down. Said staff member was maybe a little smaller than us and getting this heavy fella down off of the display case required some assistance from her teammate. Once it was within prodding distance, I was smitten. He was in great shape and with what seemed to be all of his original parts. He even had a makers mark - "W.M.DLD." Not wanting to be impulsive, we put the wheel on hold so that I could do a bit of research. After some due diligence, I learned that this wheel was made in Nova Scotia sometime around 1820/1830 by William McDonald. How it came to be in Portland, we'll never know but I'll keep researching and will surely share whatever I discover. After skeining up the old wool that was still on the bobbin, it took all of 15 or so minutes to sort out proper tension and be off spinning! Boy oh boy, does he spin like a dream. 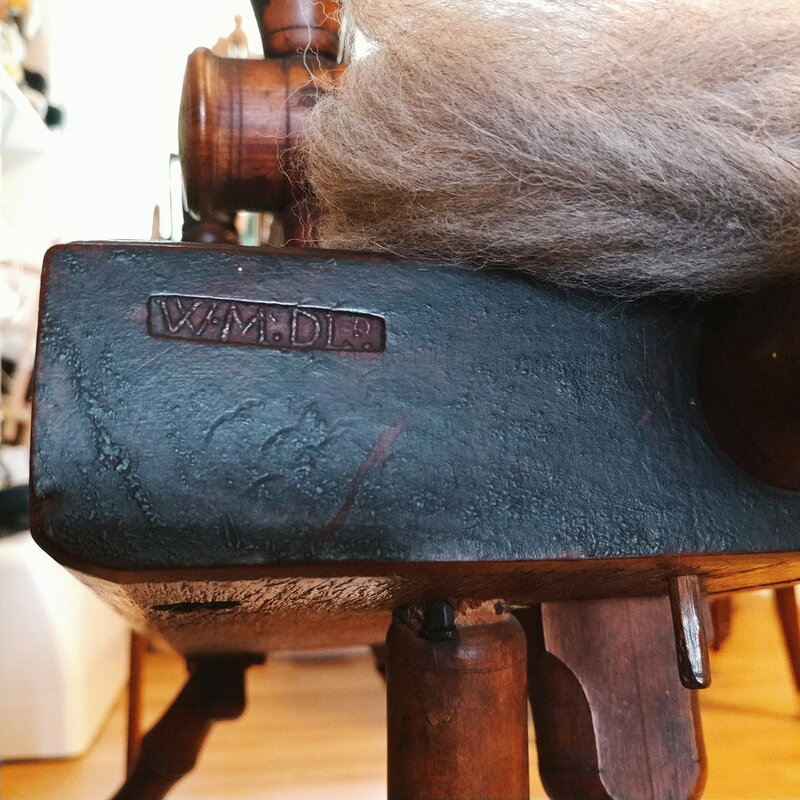 And as I treadle, I can feel the foot impression of the person (likely a woman) who spent hours and hours sitting at this wheel long before me. I could wax more poetic about what's fueled my months long search for an antique wheel, but maybe that's a conversation best had another time. There's just too much for me to say on the topic, and right now I would rather go spin on my beautiful new, old wheel!